Lamborghini will announce the flagship 2012 Aventador LP700-4 at the Geneva Motor Show, a $370,000 supercar that will replace the Murciélago model. Lamborghini has filed for a trademark in the U.S. for the name “Lamborghini Aventador” and it will feature a 6.5-liter V12, 700-horsepower engine, 509 lb-ft of torque, a single-clutch transmission, carbon-fiber monocoque build to reduce weight and fuel consumption, a top speed of 217 mph, and a 0-60 mph time of 2.9 seconds. The Aventador also has similar styling to the Lamborghini Reventon and features large air intakes behind the doors. Lamborghini is said to already be taking orders for the new Aventador LP700-4 where production has already begun in Italy. We may see the Aventador in showrooms by Q2. Gamers rejoice. Volvo releases their new video game. Free. The editors over at Autoblog must be in love with the Aventador. More details about Lamborghini’s LP700 were revealed at private showing and photo shoot preceding the Geneva Motor Show. The press were allowed to do studio photographs of the V12, 691-horsepower Aventador LP700-4 bathed in Arancio Argos – Argos Orange – paint. The deep-colored orange color was inspired by oranges grown around the ancient southern Greek town of Argos, a chief rival of the mighty killing machines over in Sparta. 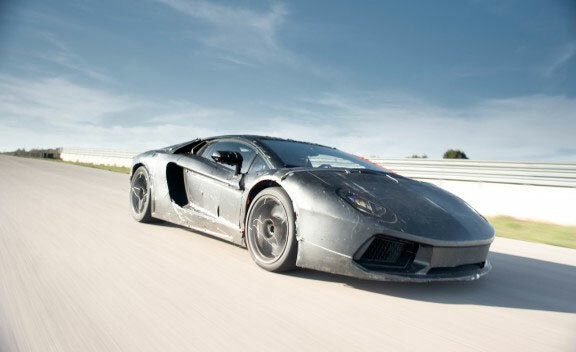 Autoblog has an article that shows the full rolling chassis minus the bodywork and interior of the Aventador. Lamborghini released more details ahead the Aventador’s debut at the Geneva Motor Show next month.